Left and Write: V: Vindicator! Otherwise known as James "Mac" MacDonald Hudson, Vindicator first appeared in X-Men #109 (Feb. 1978) as "Weapon Alpha". Having been sent by the Canadian government to bring back their Weapon X (you probably know him better as "Wolverine"). After his solo attempt fails, he returns with the rest of his group...the Canadian super team known as Alpha Flight...to finish the job. 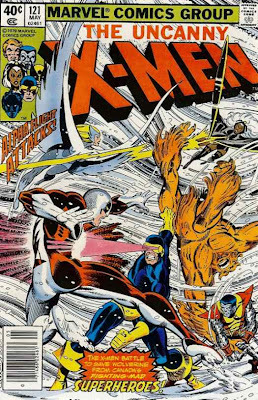 The two groups battle to a standstill when, abruptly, Wolverine surrenders and agrees to go back with Hudson to avoid any further fighting. 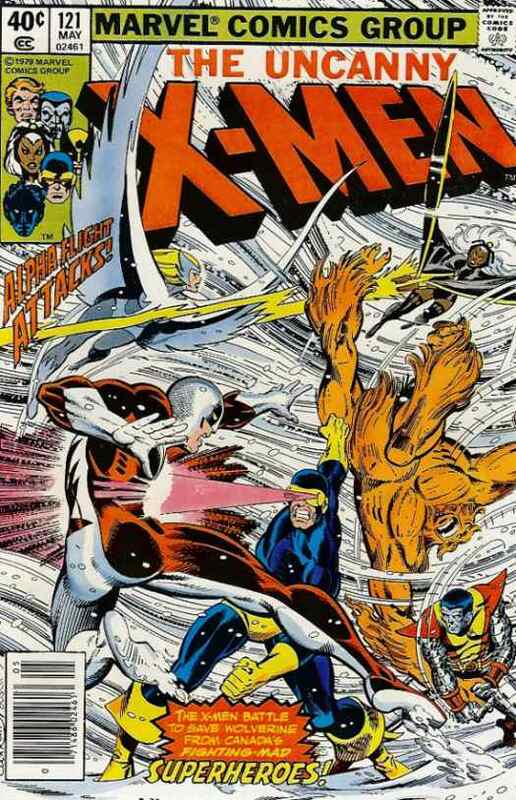 Alpha Flight packs up and leaves with Wolverine....or so they think. Telling the X-Men that there 'ain't been a cage built yet that can hold me', they all have a laugh as Hudson and his team return to Canada and realize they don't have the objective of their mission with them. 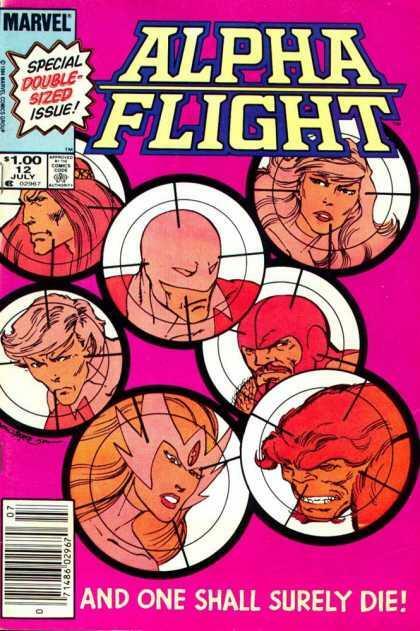 A bit later, Hudson's 'Department H' loses it's government funding and Alpha Flight disbands, temporarily. It's not until one of Great Beasts of Legend, Tundra, attacks, does Alpha reunite and save Canada, thereby regaining their official government status. Hudson going by the codename "Guardian" at this time. As we all know, death never lasts forever in the comics....especially Marvel Comics...and Hudson reappears, having opened a rift in time and space and only appearing to have exploded. Taking the name Vindicator, he leaves the Guardian name as well as his old battlesuit to his wife, who had been acting as field leader since his 'death'. Later on, Hudson is killed again...this time 'permanently'. Obviously, I'm skipping a huge part of Vindicator's history in interest of keeping this short(ish), but suffice it to say that, before he was killed again, he dealt with his own clone, aliens, and a bunch of other threats to the Great White North. Vindicator was an amalgam of sorts, of Iron Man and Captain America. His powers derived from a battle suit of his own design, which he had originally created as an exo-skeleton to aid in drilling for oil. The suit was decorated as symbol of Canada, their own version of Captain America. The new and improved suit allowed him to fly, shoot energy blasts and let him erect a force field around himself. Hudson was also a scientific genius and pretty well versed in bureaucracy...a trait he picked up from dealing with the Canadian government on a daily basis. I always liked Vindicator because he was Canadian through and through. A patriotic man who would go to any lengths to protect and serve his country, a loving husband, and a good friend to those who needed friends....such as certain, short, hairy, dude with claws. The fact that he was the symbol for a nation never made him arrogant and he was a good leader for Canada's own super group. Not too many Canadian super heroes. Sorry but it serves him right trying to mess with Wolverine. That never ends well. Duh! (I might be just a little biased here though...) Hey, want to take a little guess who my post on W is going to be tomorrow? Ha. Vindicator was kind of a Phoenix, then? But in the end something did him in. What? I don't know this superhero at all. I didn't know his suit was originally designed to drill for oil. That's pretty hilarious. I always found him to be the Canadian Cyclops - the stuffy jerk leader who was always at odds with Wolvie. So is Wolverine Canadian, then? And where does 'Logan' come in? @Alex: Not enough, in my opinion :) I thought it was always cool seeing how other country's heroes operated. @Lee: Well, sort of...yes. The writers brought him back and explained away his death, then he was killed (again)in another story line by an evil mutant. @John: Heh, yep. His battlesuit was based off the plans he designed for an oil company, which was why they came after him in the pages of Alpha Flight. They wanted the design back. @Jack: He was featured in X-Men back in the 70s, so they might have seen him around there. Oh, duh, Vindicator. I should have just known that without thinking. I guess I've been out of comics longer than I thought. 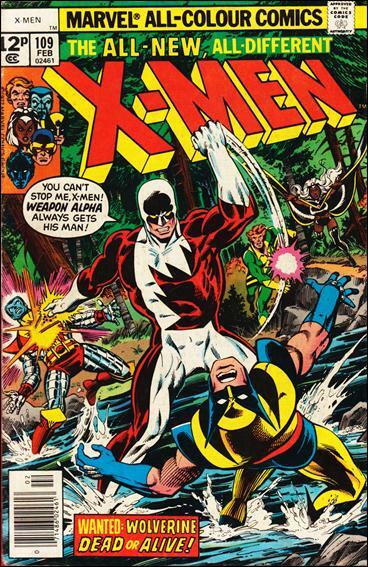 Oh, and just to go from your last comment, Wolverine was always meant to be Canadian. His first appearance was in Canada in a Hulk issue. 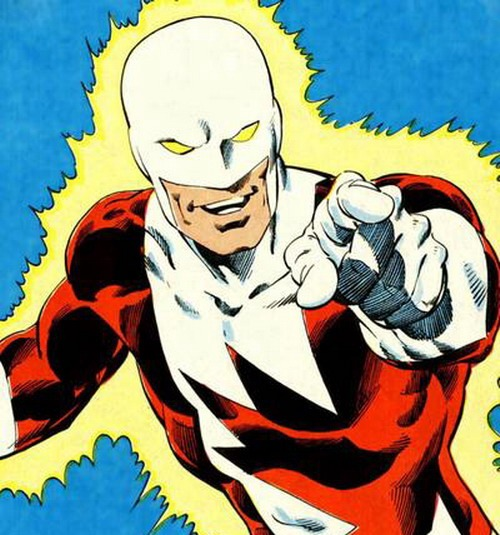 That was pretty much all there was to it, though, until John Byrne got a hold of him and, as a fellow Canadian, turned the character into something bigger than what was originally intended. Well, I was so busy yesterday that I forgot to think about it at all and didn't remember till I saw your post this morning. Then, it was too late. Aw, he thought he could catch Wolverine, so sad. This was a great one today Mark and it's true that death in comics is never really 'death'. Your post brings back such wonderful memories searching through Marvel Comics at the Five & Dime. I'm looking forward to next weeks release of Ironman. Nobody should ever mess with Wolverine! Very confusing, these comics are. My son loves them. I should mention these. and the back and forth and the intrigue. Your Canadian super people sound romantic, like the Mountie. I was in love with them when I was young. We are nearing an end of A-Z and I'm just learning to appreciate comics. Thank you for always visiting my dance post, even though it's not your cup of tea and mine wasn't comics either but see, I've learned to find delight with them. Even though I have never even heard of him until today, I am actually really sad that they killed him off. I feel like I've been through the wringer. I only just found him to know that he died. He went through several name variations. I feel like singing, "Vindicator I barely knew ye." Or would that be you? Anyway, he was here and gone. Shame, he had a cool name. That tricky Wolverine. I like the sound of the Vindicator. That's a lot of name changes. I enjoyed the X-men cartoon. My brothers watched it a lot while we were growing up. Which helped when the first X-men movie came out. I was able to impress my hubby with my X-men knowledge. Trying to bring in Wolverine has to qualify as a suicide mission! @Julie: It's been one of the most fun things about this theme, digging up those covers. Brings back a lot of good memories. @Cathrina: I remember going through the spinner racks to find comics...good times :) And, yeah, can't wait for Iron Man 3! @Sherry: Ain't that the truth! @Miranda: I know, they can be a bit confusing, for sure. @Diane: I agree...it was a very cool name. @S.P: Yep, I liked that cartoon too...even though I would, sometimes, nitpick that they weren't 'sticking directly to the comics', but it was still a fun cartoon. @Shell: Heh, yeah some of them have more lives than a cat... as long as the writers can use them. I had no idea there were so many comic book heroes, and heroines. Hope that means the movies will continue, love the uplifting battles of good against evil -- fairy tales for the adults, and yet it fills a desperate need sometimes. Hmmm...I want to create some cool superhero suit and with it gain cool powers :) I love the suit- their version of Captain America. So very cool. Gosh so many names! And it's funny how superhero deaths are not always permanent in Marvel comics. I just want to congratulate you on this Challenge, Mark. You've put so much work into your posts, sharing some really need background information and delightful images. It has been so fun taking this journey with you. I have a new appreciation for comic books and characters that I know I never would have had without reading your work. Best of the weekend to you! Hi Mark - well so pleased you've been able to highlight Vindicator - the Canadian hero .. he does sound rather lovely! You can tell I'm so unknowledgeable it's embarrassing!